The restoration of the Jaguar E-Type 2+2 over the last few months has occurred sporadically, with various odds and ends taken care of. Isn’t it oh so “odd” that this restoration never seems to “end”! One item that I dealt with was a resistance to the steering effort as I turned the wheel left of center. I was to find that this problem was self-inflicted. Earlier this year, I had pulled off the steering wheel that came with the car and attempted to install a replacement wheel. The replacement wheel was also a genuine E-Type wheel from another car that I had refurbished. I stripped the old wood off the rim and installed new wood that I had purchased from British Autowood in Florida. The new wood rim came with detailed instructions. It comes in 2 halves that are clamped and glued together over the metal spoke and hub assembly. After the glue was dried, I sanded the wood with gradually finer grades of sandpaper. Per the recommendations of the instructions, I purchased a walnut wood stain and applied it. Next the instructions recommended the application of a polyurethane finish coat. It is a pet peeve of mine that it is getting very hard to tell real wood trim in cars from plastic imitations. Part of this is due to the fact that both the real thing and the imitations get slathered in high gloss protective finishes. I decided to go another route and seal my wood rim with Tung Oil. The tung oil is absorbed into the grain of the wood, providing protection, but still gives my fingers a nice tactile feedback to let me know I am grasping real wood. I like the result! So back to the self-induced problem. To remove the steering wheel, you first take out 3 very small grub screws just behind the horn button, which serve to release the button. Inside, a spring loaded rod is exposed which can be withdrawn. It is over a foot long and extends down into the steering column. After the rod with its spring and washer is removed, there is a large nut that must be removed with the proper size socket. At this point the steering wheel “should” come off. But it sits on a splined shaft and if it has not been removed in a while you might need to adapt a gear puller to get it off. So I took the old wheel off, installed the new one, and re-assembled the pieces. Now the horn didn’t work! I learned a lot about the horn mechanism! More that I can try and explain in words. Contact me if you want the details. But in essence, that long rod that I withdrew is suspended in electrically insulated sleeves. 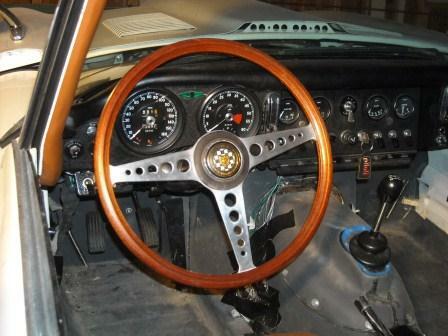 The rod rotates with the steering wheel and has one sliding contact within the steering column that completes the circuit onward to the horn relay and the horns themselves. This sliding contact is not very robust and I managed to mangle mine putting the rod back in. A few hours later I managed to repair it with some ingenuity and home made parts, including the spring from a ballpoint pen! So I carefully had the steering column back together and the horn was working. But now the steering wheel didn’t turn smoothly. I had to take the steering column back apart and check everything out again. Finally, I noticed that the connection of the steering column shaft to the universal joint just above the pedals is a slip fit that has to be adjusted just so or the turn signal mechanism wobbles and grabs the wheel as it turns. Wow, what a temperamental collection of parts! I finally got it all back together with a functioning horn, my new wheel, the turn signal arm returning to center with the wheel, and smooth turning of the wheel. Whew, that took way too long! It will go quicker the next time. The next odd job was trying to resolve drips of brake fluid on the garage floor. 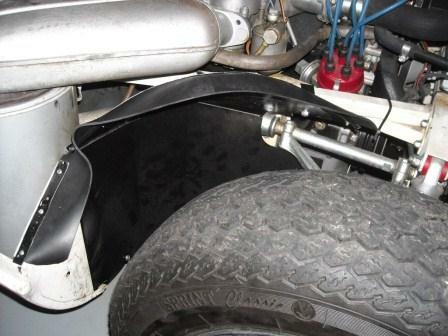 I had recently dropped the independent rear suspension (IRS) to address previous difficulties with the rear brakes that I had attributed to overheating from hard use at the track. I had simply replaced the rubber seals and put things back together. Within days of finishing this job, I started to find drips of brake fluid on the floor. I choose to go into denial mode for a few weeks and just kept an eye on the fluid level in the brake fluid bottle. But eventually I had to admit that this was not a good state of affairs so I proceeded to examine all the brake lines and parts very carefully with a strong light. As far as I could tell, the fluid was weeping from the rear brake calipers. In desperation I tried snugging up all the flare fittings on the hydraulic lines in the vicinity but that did not solve the issue. So it was time to drop the IRS again. I’m getting very good at this job and had it out in record time. Getting the brake calipers extracted from the IRS housing is a job invented by sadists! There are several fasteners that yield less than 1/8 of a rotation before the wrench fouls on something. So it takes quite a while to get the calipers out and onto the workbench. Once on the bench, the problem was pretty obvious. During the initial restoration of the brakes, I had sent the original 43 year old calipers out to a shop to be “sleeved”, in which the corroded bore is opened up with a cutter and a thin cylinder of brass is pressed back in to bring the interior sealing surface back to a good condition. For reasons I have yet to ascertain, 2 of the sleeves were starting to work their way out of the caliper, with a resultant leak path being exposed for the fluid to seep out of. Big sigh!! So this time I bit the bullet, called SNG Barrett, and ordered brand new calipers. $440 worth of new calipers. Ouch! Nobody ever said Jaguar restoration was cheap. As of this writing, the new calipers are installed, the sadists enjoyed watching me re-install the hard to reach bolts, and the car is back on 4 tires. I hope this is my last brake job at the IRS for a while. The final job that I did recently was to get started on re-installing the various sheet metal panels and shields in the engine compartment. These had of course been removed years ago when I dis-assembled the car. I was able to find most of them. One is missing and if it does not turn up, I will have to fabricate a new one. Another was very rusty (the one under the battery) so I used the rusty one as a template and made a new one. Pretty straight forward stuff here. Find the piece, clean it up in the bead blaster, and paint with cheap black enamel paint just as they did at the factory. I have 2 hot tips here. If you are not up for making your own panels, John Farrell in West Babylon, NY has many of these pieces (and a whole lot more) available for sale. Contact him for his catalog. He is also a very pleasant guy to talk to on the phone. A real Jaguar enthusiast. (http://www.fortunecity.com/silverstone/tread/1046/index.htm). The second tip I am amazed at. After all these years, I find out that there is a specific Jaguar parts catalog for the 2+2. If I had only known this sooner. This and other publications are available in the “Shoppe” section of www.JCNA.com. It contains a pictorial view of all the panels that I was attempting to install and was very helpful in identifying the pieces and their locations. Whether you are restoring a Series 1, Series 2, or a 2+2; you owe to yourself to purchase one of the parts catalogs. They are invaluable. « 46: Windshield Installation – Again!